I purchased a scullmatix for my boats, and I gave it a whirl in the local pond. 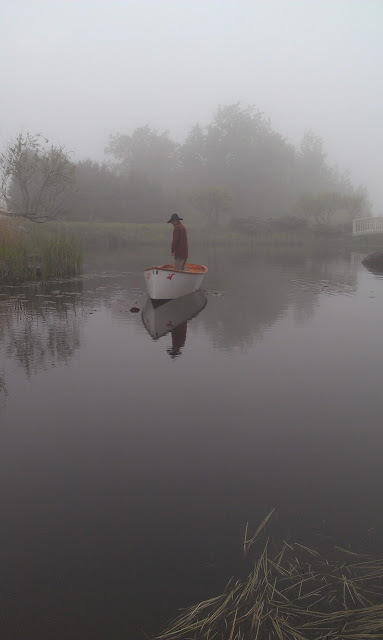 My lovely wife took a picture of me sculling through the fog on IAZ,P. It works... but I need more room to get it really going, me thinks. I'm primarily going to use it for the Sea Pearl 21. Beautiful photograph! What is this .. "fog"? There's a guy in our sailing club that uses a home built skullamatix on his Bay Hen. He can move along at 1-2kn with little effort. You can see it at about 1:45 mark in the Lake Tarpon vid I just posted. the Sea Pearl is about right. A Scullmatix, or any sculling device works best on a heavy boat. A Goat would be best rowed or paddled - in my opinion, at least. The Goat is too light with not enough boat in the water, the boat would wallow back and forth in opposition to the scull, but we did go forward and I liked it. I tried it in the Sea Pearl, but I need to elevate the oarlock over the transom to keep the extender from whacking the gunwale on the return stroke. It should work just right in the SP. Simon, yes it is "fog". You may remember "fog" from your northeast days.